We won’t wax lyrical about Drone laws, because unless you’re becoming a commercial Drone Operator, it’s not particularly interesting in all fairness. Using a drone for anything commercial, whether being paid or not, is illegal unless the operators has a ‘Permission For Commercial Operation’ – handily known as a ‘PFCO’. 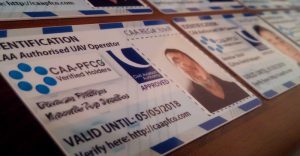 ALL the people who carry the CAAPFCO VERIFIED ID card are independently checked for a valid PFCO. If in doubt, check the date, and check up on validity here or find the link through the CAA’s own website; http://www.caa.co.uk. All CAAPFCO VERIFIED Operators are legal, insured, and safe. Using someone who does not carry a PFCO, not only puts you at risk of prosecution, but it also puts your company at risk if something goes wrong, for example, if the drone experiences a ‘fly-away’ and decides it wants to fly into a person. Yes, fly-aways do happen. Above all, all CAAPFCO VERIFIED operators know what you can and can’t do, and where and when you can. They do the worrying, so you don’t have to, essentially. If you’d like to know more, then watch this short video which explains it in a simple, easy to understand way.